Given the cataclysmic events just over the horizon in 1929, the year 1928 should have, at least in retrospect, provided a clue or two of the impending financial disaster. There was nothing of the sort- unemployment was at 4.2 percent and dropped to 3.2 percent in 1929 before the crash. Gross National Product rose throughout the year. The world was for the most part at peace although there was political turmoil in Russia where Stalin exiled Trotsky and launched the Soviet’s first five year economic plan. Hoover beat Al Smith in the presidential election in November and pronounced in his inaugural address with not unreasonable confidence that “No country is more loved by its people. I have an abiding faith in their capacity, integrity and high purpose. I have no fears for the future of our country. It is bright with hope.” Standing in a pouring rain which dumped nearly half an inch on the crowd and the new President Hoover had no reason to suspect the country’s future was no brighter than the sky or, for that matter, poor Trotsky’s who was later murdered with a icepick by a Stalin henchman. What 1928 lacked in wars and political conflict it made up for in other areas. Lindbergh’s transatlantic flight on May of 1927 led to dozens of flying firsts in 1928 including the first flight from England to Australia, the first over the Pacific and the first woman crossed the Atlantic though only as a passenger. The woman was, of course, Amelia Earhart. Inventors and marketers introduced Scotch Tape, the electric razor and Velveeta cheese but none could compare with the greatest culinary development of all time, sliced bread which created quite a sensation when it a landed on the grocery shelves. All subsequent inventions have been compared to this epochal product. The first office was built with air conditioning and, in culture, Mickey Mouse made an appearance in his first film, the first fully “talking” moving picture hit the screen and Amos and Andy made their debut as did Mae West in what was described as either a “daring” or “scandalous” play titled “Diamond Lil”. Thornton Wilder won the Pulitzer for Bridge at San Luis Rey. In medicine a London scientist studying the bacteria which caused strep throat named Alexander Fleming came home from holiday and noticed the precious bacteria in one of his petri dishes had died. A strange mold later determined to be a rare form of penicillin had contaminated the petri dish through a window left inadvertently open and its secretions had inhibited the growth of the bacteria. The world of medicine was forever changed by what became known as antibiotics. In sports Ty Cobb stole home for the last time and on September 7th, 1928 got his 4191th and last hit. On May 26th 1928 the Yankees took the field against Athletics, a game the Yankees won 9-7. The game is remarkable because 13 future Hall of Famers played in the the game: for the Athletics: Cobb, Speaker, Collins, Grove, Foxx, Cochrane, and Simmons and on the NY side, playing that day were: Ruth, Gehrig, Durocher, Combs, Lazzeri, and Hoyt. The managers were Miller Huggins and Connie Mack also both Hall of Famers. The Presidential election of 1928 which pitted the “Happy Warrior” Al Smith against his Republican opponent ” A Chicken In Every Dinner Box” Herbert Hoover was hotly contested. Alderman Jim Rigley and the Mayor Jack Woodman were great friends but on opposite sides in the election. They agreed the backer of the losing candidate would be hanged and buried so as to never again inflict his absurd and unsupportable political opinions on the citizens of Calais. Rigley’s candidate, the Happy Warrior, lost and Rigley paid the price in the above photo. 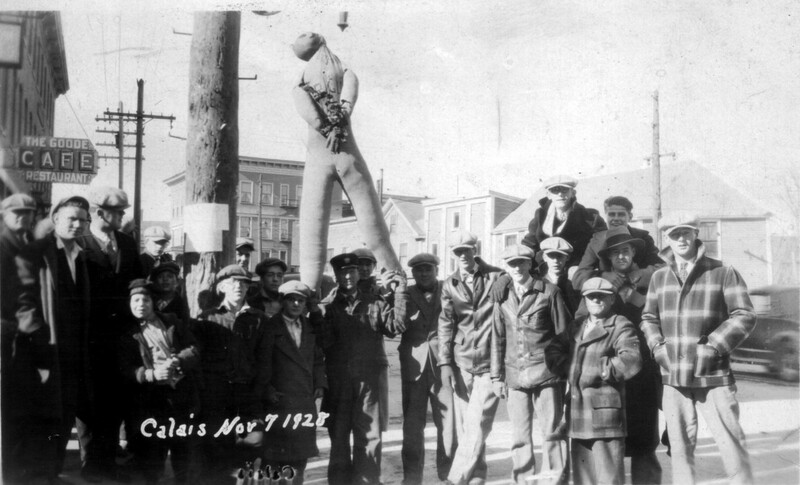 Jim was a popular guy in Calais and though rather obtuse politically and certainly deserving of hanging, the citizens felt it only just and proper that he be given a decent send off. 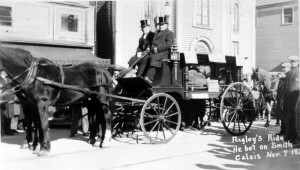 Mayor Woodman’s henchmen arranged for his corpse to be paraded through town before being interred in an unmarked grave. 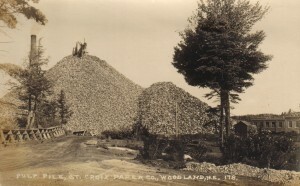 Up in Woodland the paper mill was booming as was the town. The population of the town had reached nearly 2500 and demand for the mill’s products continued to increase. “The first paper was run off the machines in the fall of 1906. 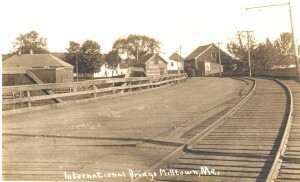 The first streets to be developed were Mill Street and Main Street. 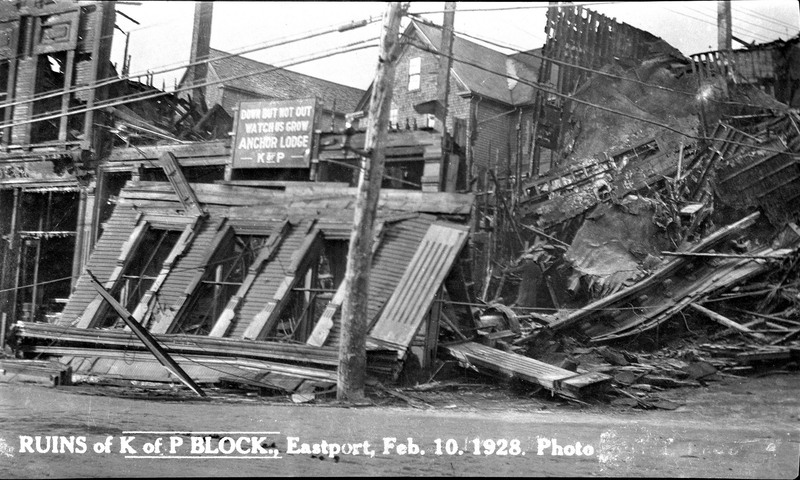 The first shopping center contained, the Post Office, Drug Store, Eastern Supply Store and a restau­rant. There were rooms for rent over the complex. 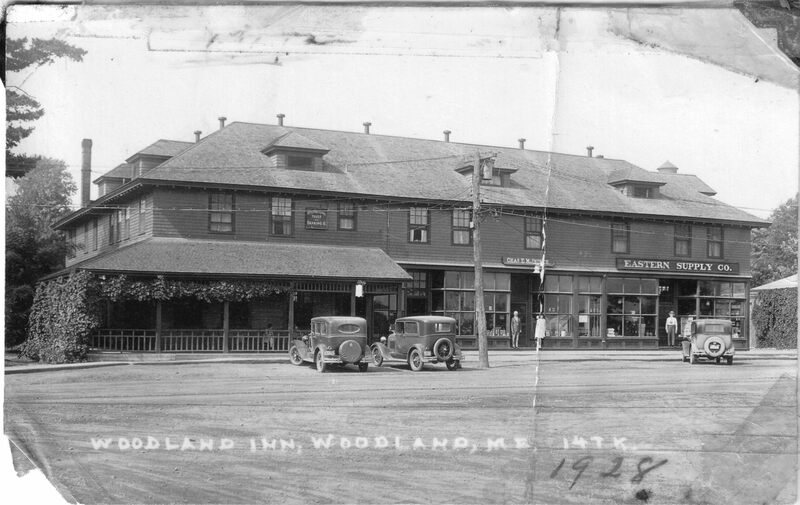 Later it was known as The Woodland Inn. 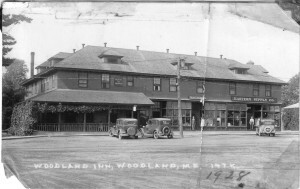 The whole complex was razed to make room for the present shopping center in 1965. The Merrill Trust Bank Building was for many years known as ‘the Company’ or ‘Brick Garage’. Charles An­drews was the general factotum of it. In it were kept the cars of the management. Also Charles kept the trucks of the company in repair. 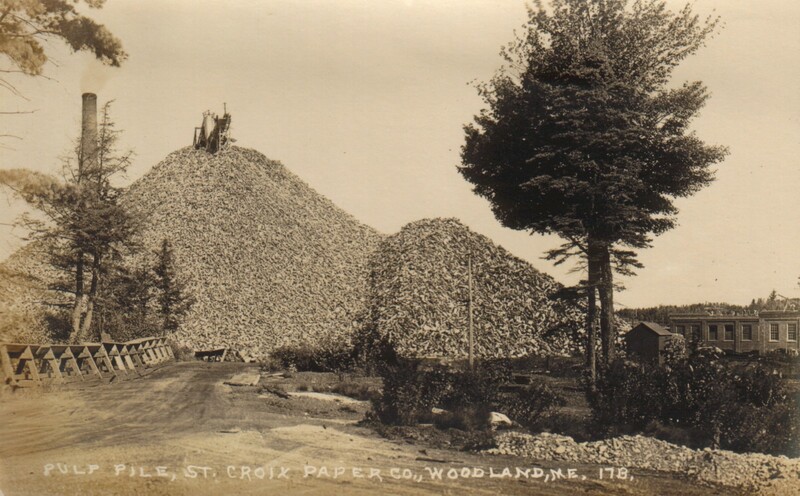 He also was the official driver for the St. Croix Paper Co. He and Mr. L.J. Parent were sev­erely injured in an automobile accident one winter, when winter driving was not the common thing to do. Banking for many years was conducted on a once a week basis under the banner of the International Trust and Banking Co., of Calais. That banked closed its doors in the Bank Holiday of 1933. They had a cage in the lobby of the Woodland Inn. Previously banking was conducted in a room over the Bowling Alley in Foggia’s Opera House. When the automobile became more prevalent, bank­ing was done in Calais. 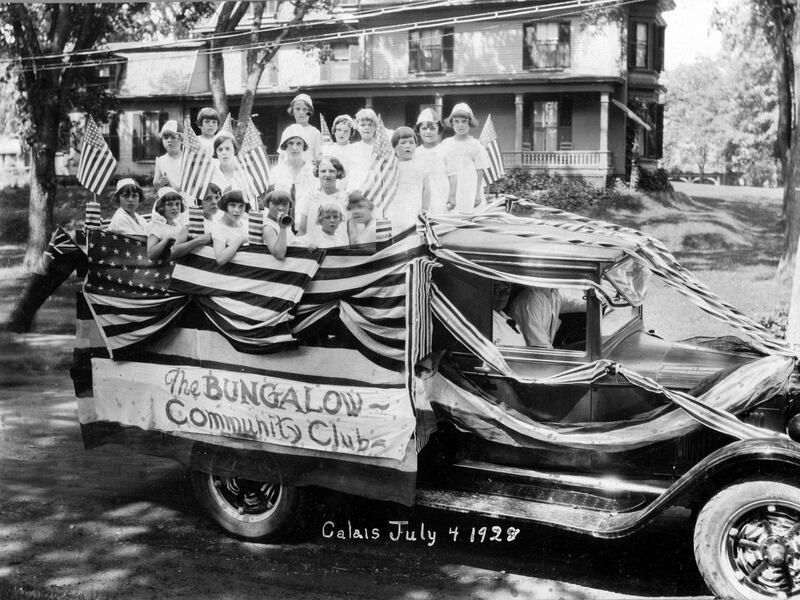 Calais’ 4th of July parade included a float from the Bungalow Community Club about which we can find nothing more. This photo was taken on Washington Street in front of the old Doc Day house on the corner of Church Street next to St. Anne’s Church. 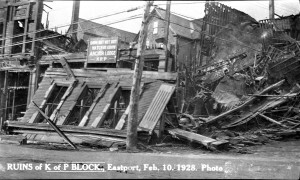 It was torn down when the new post office was built. 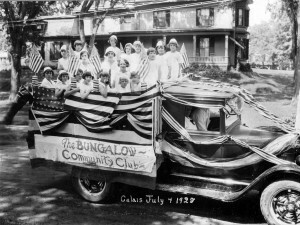 In those days the parade route usually included Washington Street. 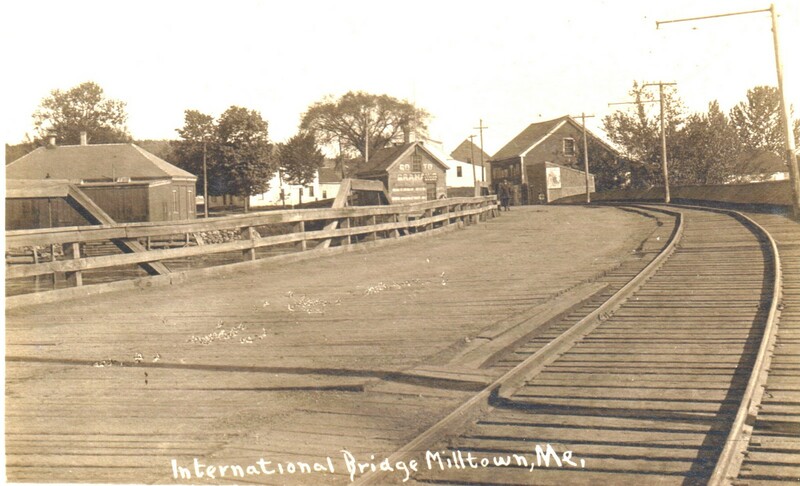 We’ll end 1928 with this photo of the Milltown Bridge taken from the customs house in Milltown NB. We find this photo interesting because where we expect to find a customs house there is instead a small shop and a larger building on which is painted “Willam Tell Flour” “You knead It”. Only on close inspection do we locate a small sign “Customs House” on the building to the left of the bridge on which is painted “Go to Graham’s if you want the newest and best for the least money” Apparently customs operated out of some portion of this building which on closer inspection appears ready to topple into the St Croix. The Water Company building is to the far left and in the foreground are the streetcar tracks which would remain in use for only one more year.